Thermostat cover - Temco Controls Ltd.
• Each model furnished with one key and can be mounted vertically or horizontally. • Clear plastic models for applications that need the thermostat visible. 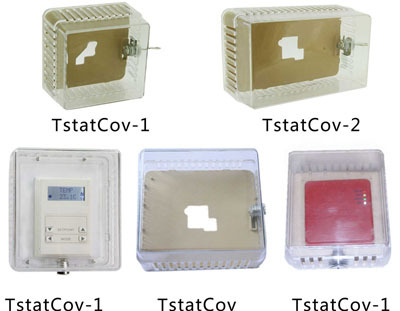 • Opaque plastic models for applications that require the thermostat be kept hidden from view. • Each model furnished with a ring and/or solid wall mounting plate. Durable Plastic Thermostat Guards are designed for use in offices, churches, restaurants and other public areas to prevent adjustment of the temperature by unauthorized personnel.Durable Metal Guards are designed for government, military, industrial and educational applications to prevent adjustment of the temperature by unauthorized personnel.